﻿The extent and depth of research and collaboration, within the College and beyond it, really sets Christ the King apart. There are opportunities for staff to become involved at every stage of their career. In this way, they are developing their own subject expertise and providing leadership for others. At Christ the King, we are committed to an approach where our practice is reflective. Small-scale action research projects are undertaken by those on the Cross College leadership programme and the early years / NQT Catholic Teachers Alliance programme. Investigating the use of praise within a classroom to promote the concept of "thinking hard"
Creating a mentally safe classroom to raise attainment. The impact of constructive feedback on learner achievement in Business Education. Developing rich subject knowledge and expertise -super-curricular reading in English Literature. Breaking the lid? The impact of target setting on 16-19 educational performance. Character Education and the CTK graces: An exploration of current delivery, future delivery, embedding and potential impact. Vocational Education and Employability in a Competitive World. The College also supports course fees for Masters degrees or other types of further study. A contribution towards course fees is available for up to two years. What strategies do independent schools utilise to ensure their pupils achieve top grades at GCSE and A Level in English, Maths, Biology, Chemistry and Physics and how do they secure places for their students at Russell Group universities in such large numbers? Are the strategies transferable to the state sector and can they be scaled up so that they can made available to a wider community across London? This involves the college working collaboratively with other schools across KS4/5 and across the independent and state sectors. Our fellow participants are Eton College, North London Collegiate, St Paul’s Boys School, Wellington College, Bonus Pastor College, Conisborough College, and St Columba’s Boys School. Nearly 50 teachers across the participating schools have taken part in the research and some 400 students across the institutions have also taken part in surveys. Project participants have engaged in a number of exchanges and visits where staff learn and benefit from each other’s’ expertise. Subject networks have been established to share good practice and test established views of best-practice pedagogy. Curriculum networks have been established to strengthen professional communication between teachers across the three Christ the King sites. The college has some 15 different subject networks which are attended by over 150 staff. The networks are made up of like-minded colleagues seeking to develop and exchange professional expertise. They provide a community engaging in dialogue with a shared aim of improvement and excellence. 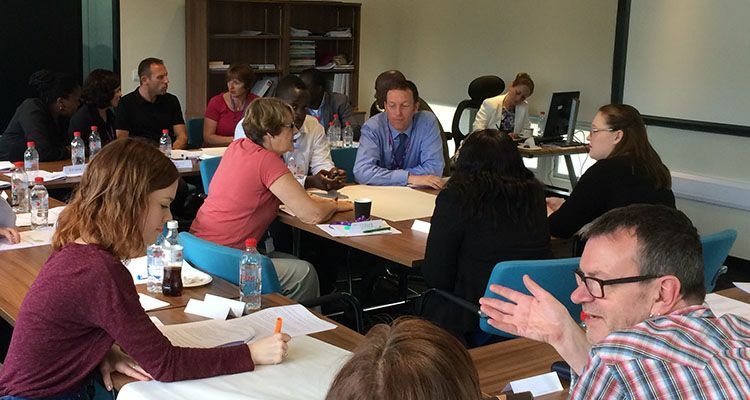 This is a group of schools and colleges in the Southwark diocese (South London and Kent) dedicated to developing staff with high expectations and a clear understanding of how to create a learning environment in which students flourish. Expertise is shared across the alliance during INSET events and via Specialist Leaders of Education (SLEs). Newly Qualified and Early Career Teachers have the opportunity to engage in school-based reflection and research and to visit schools and colleges across the alliance in order to develop practice.